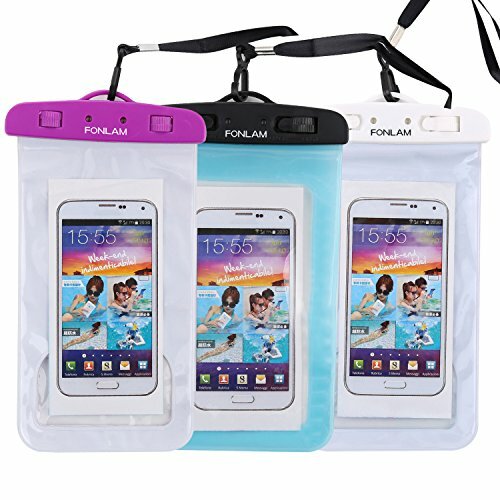 FONLAM Designed for underwater use, swimmers, surfers and scuba divers, this rated IPX8 certified waterproof bag can guard your phones from water, ice and dirt. Our waterproof bag not only guards your precious cellphone from water, sand, dirt and snow, but also keeps your cash, credit cards, ID cards, passport and other personal belongings dry. Sony Xperia Z3, Z2, Z1 Huawei Honor 5X 6X 8 Mate 9 Mate 8 Huawei P20,P20 Lite,P20 Pro,oneplus3T,oneplus3,oneplus2, etc. This Waterproof Phone Case keeping your phone safe, sound and dry under extreme conditions. Cell phone may suffer hydraulic pressure under certain water depth , which will impact the the operation of the touchscreen. Please take photos by volume buttons in this case. 【Universal waterproof phone case dry bag】fits all smartphones up to 7.0" diagonal size (Certain big screen phones need to remove protective case); Credit card wallet money waterproof dry bag for beach, fishing, swimming, boating, kayaking, snorkeling and water park activities. 【IPX8 Certified waterproof 】IPX8 Waterproof Phone Pouch Dry Bag/waterproof cell phone case provides waterproof / snowproof / dirtproof protection for your device while maintaining full touch screen functionality. 【Compatible with devices 】Cellphone waterproof case fits all smartphones up to 7" diagonal size (clear window 180mm X 110mm), including iPhone X 7 Plus 8 Plus 6S 6 Plus, iPhone 7 6S 6, iPhone 5 5S 5C SE, Google Pixel XL, Samsung Galaxy S8 S7 S6 Edge S6 S5 S4 S3 Note 5 4 3, LG, HTC, Huawei and other mobile phones; Comes with a neck strap for convenient carrying. 【Convenient Design】Features a simple snap and lock access, easy to keep out water, snow, dust, sand and dirt. If you have any questions about this product by FONLAM, contact us by completing and submitting the form below. If you are looking for a specif part number, please include it with your message.